Eczema vs. Acne: Which Is It? Red, inflamed skin is easy to spot. What can be hard to figure out is the cause of your breakout. It may be acne, but it could also be eczema. Here's how to tell which skin condition you have so you can get it under control. Both are common skin problems that can happen at any age. Each can flare, go away for a while, then return. And both these skin issues can be stressful and embarrassing. But acne and eczema are different in many ways. Eczema, or what's sometimes called atopic dermatitis, is an autoimmune condition. That means it's caused by a problem with your immune system. Doctors don't know why it happens, but your skin doesn't make as many fats and oils as it should and has a hard time holding on to moisture. You're more likely to get it if it runs in your family or you or any family members have allergies, hay fever, or asthma. Eczema can happen anywhere on your body. Babies and children are more likely to have it on their faces. It can look different from person to person. Some people get rough, leathery skin, while others have red or brownish-gray patches or small raised bumps on parts of their body. Swelling, oozing, and crusting are other signs. But the most common symptom of eczema is itchy skin. Acne affects the oil glands under your skin. When the tunnels that connect those glands to small holes on your skin's surface (pores) get clogged, a pimple grows. Sometimes, these bumps have pus in them and hurt. Acne breakouts most often happen on your face, neck, back, and shoulders. You won't need a lab test to know if you have acne or eczema. A dermatologist (skin doctor) will be able to tell which you have by looking at your skin and asking about your family history. 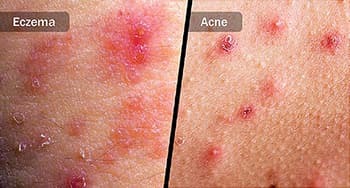 Acne: Your doctor will try to make your acne go away and keep other pimples from forming. The quicker you start treatment, the less likely you are to have scars. Several different medicines can help get rid of acne. You put some right on your skin (called topical medication), but you may need a stronger drug if your acne is severe. This could include an antibiotic for several months, high doses of vitamin A (isotretinoin), light therapy (your skin is exposed to special lights), or chemical peels or facials to pull out the pimples. Eczema: There's no cure for eczema, but your doctor will try to ease your pain and itching and keep your skin from getting worse. Many prescription creams can help with your symptoms. Some have steroids in them, while others have drugs that ease inflammation or affect your immune system. If your itching's severe, your doctor may give you an antihistamine (usually used to treat allergies). "Wet wrap" therapy can also soothe your skin. Wet bandages are put on your skin to keep it moist and help it take in the medicine better. As with acne, light therapy can also be good for your skin. Be gentle. Use a mild soap to wash your skin twice a day and after sweaty exercise. Go easy. Scrubbing or using harsh cleaners can make it worse. Try not to touch the area. If you have itchy eczema, try not to scratch. This can break your skin and lead to infections. If you have pimples, don't pick or pop them. Stay safe in the sun. Some drugs for eczema and acne make your skin burn faster. Try to stay out of the sun between 10 a.m. and 4 p.m. when the sun's UVB burning rays are most intense. If you have eczema, use a mineral-based sunscreen with zinc oxide or titanium dioxide. People with acne do best with a brand that's oil-free or "non-comedogenic," meaning it won't block your pores. Relax. Stress and anxiety can make both acne and eczema flare. Try meditation, take a yoga or tai chi class, or find other ways to calm yourself. Put your best face forward. If your skin condition makes you self-conscious, you may want to wear makeup to help cover it. But you need to use the right products. Some makeup can help absorb oil, others cover up redness and smooth out your skin. Ask your doctor about what would be best for you. National Institute of Arthritis and Musculoskeletal and Skin Diseases: "What is Acne: Fast Facts." National Eczema Society: "What is Eczema?" National Eczema Association: "You're not alone," "Atopic dermatitis: All in the Family?" "Sun Protection," "Sunscreen." American Academy of Dermatology: "Adult acne," "Atopic dermatitis," "Reducing stress may help lead to clearer skin," "Proper skin care lays the foundation for successful acne and rosacea treatment." DermNet New Zealand: "Complications of atopic dermatitis." Mayo Clinic: "Acne," "Atopic dermatitis (Eczema)," "Helping Stop Pimples." American Family Physician: "Diagnosis and Treatment of Acne." National Jewish Health: "Eczema: Treatment," "Wet Wrap Therapy."